A free weight is any type of weight training equipment that does not limit the range of motion with which you can use it. These types of weights are useful for building strength, speed, flexibility, balance and muscle mass. Weight lifters of all skill levels can benefit from the use of free weights, provided that they train with proper form at all times and understand the function and limitations of this type of equipment. A common type of free weight is the barbell, which allows you to load weight plates onto the ends and clamp them in place. Barbells come in various lengths and can be used for a wide range of exercises, such as the bench press, squats and curls. Other types of free weights include dumbbells, kettlebells and medicine balls. 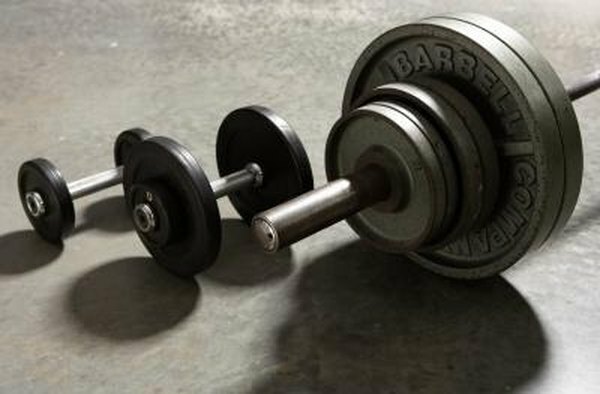 Some dumbbells and similar free weights are adjustable like barbells, but many are made of solid steel so they are highly durable. According to the American Council on Exercise, training with free weights provide better overall strengthening than using machines because they mimic natural movements. Because you are not limited in how you move the weight, many trainers use free weights to help athletes and clients build the muscles they require in their sporting and daily lives. Additionally, free weights engage stabilizing muscles throughout your body as you balance the weight, so you become stronger overall and improve your balance at the same time. The same freedom of motion that makes free weights beneficial for strength training also makes them significantly more dangerous than weight machines especially when doing overhead motions. The American Council on Exercise points out that learning to isolate a muscle when using free weights to train properly can be difficult without guidance. Unless you use slow, controlled movements, you end up swinging the free weights leading to momentum doing most of the work and increasing your risk of injury. Free weights are relatively inexpensive when compared to a weight training machine. With just a barbell, some weight plates and perhaps a pair of dumbbells you can accomplish a comprehensive full body workout. Additionally, free weights require very little maintenance, unlike machines that have moving parts and can break down after a few years of use.